Cultural events are often built on the efforts of citizens who turned them from concept to reality. As a young mother and relative newcomer to Ketchum, Jane Eittreim joined the original steering committee to restart the Wagons Days festival in 1976. The rest, as they say, is history. Eittreim, who now resides in Bellevue, has been named grand marshal for the 2014 Wagon Days celebrations, 38 years after she served as secretary in a group of citizens who had no idea whether they could even get the event back off the ground after a hiatus. Originally from Phoenix, Eittreim moved to Ketchum as a full-time resident right after the birth of her son, Ryan, when her then-husband got a job doing accounting work for Bill Janss, then-owner of Sun Valley Resort. She’s lived in the Wood River Valley “on and off” since 1970. While the parade began in 1958, there was a six-year hiatus from 1970 to 1976, Eittreim said. She said the Lewis family, who donated the historic Lewis ore wagons to Ketchum, stipulated in their gift that the wagons had to be shown annually. At the time, they were housed in Sun Valley Resort owner Earl Holding’s storage unit and fell into various states of disrepair. Four men had to go over the wagons for hours with linseed oil, as well as repair bows and replace canvas, for them to be parade-ready. “We cleaned the wagons up, pulled them out of storage and took them to the red barn on Warm Springs for [the men] to work on them,” Eittreim said. Today considered the best-preserved of their kind, the 1880s-era wagons were used to carry ore from mines around the valley to the Philadelphia Smelter on Warm Springs Road. Funding to restart the parade was a daunting prospect, Eittreim said. The team found out they could qualify for a bicentennial grant, but they needed representation from a local government official. That’s where then-Mayor Jerry Seiffert came in and joined the committee. “We did get funding and it went off and we all sighed with relief afterwards that we all pulled it off,” Eittreim said. Finding animals to pull the wagons was another challenge. Eittreim said they used horses out of necessity that first year, but over the years they enlisted Bobby Tanner and his Borax 20-mule team out of California. The mules are controlled by a jerkline hitch system that guides the animals by a series of pulls on a connecting line. 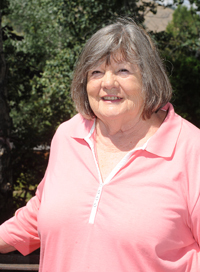 In 1976, Eittreim used her connections within the local Papoose Club, a charitable group centered on funding children’s educational opportunities, to cook a pancake breakfast for participants and visitors. “We were so nervous fixing breakfast that morning because we had no idea if we’d have a lot of people or a few people,” she said. With over 200 people in attendance, Eittreim said, they had enough ingredients to keep festival-goers fed. The emphasis was feeding the participants, since animal handlers didn’t like being away from their animals to go wait in line at a restaurant. Eittreim was in charge of feeding participants lunch for 13 years, even when the crowd swelled to more than 15,000 visitors in recent years. Despite her ties to the Southwest, Eittreim considers Idaho her home. In Eittreim’s Bellevue home, pictures of her son riding with the Shootout Gang in 1976 and large wagon spokes adorning her living room are an indication that Wagon Days has shaped her life and family over the years. Ryan, now a resident of Park City, Utah, comes back every year to volunteer as a brakeman in the parade. He’ll be seated next to her in the cadre when she officiates as grand marshal next week. From a good group of Ketchum friends wondering if they’ll have enough pancakes in 1976 to an enduring legacy of history rooted right here in the valley, Eittreim’s contributions played no small part in making Wagon Days the pivotal event it is today. The Wagon Days Committee and the city of Ketchum are inviting the public to join them in celebrating Grand Marshal Jane Eittreim on Friday, Aug. 29, at Memory Park in Ketchum from 5:30 to 7:30 p.m. The reception will offer live music, food and drinks.